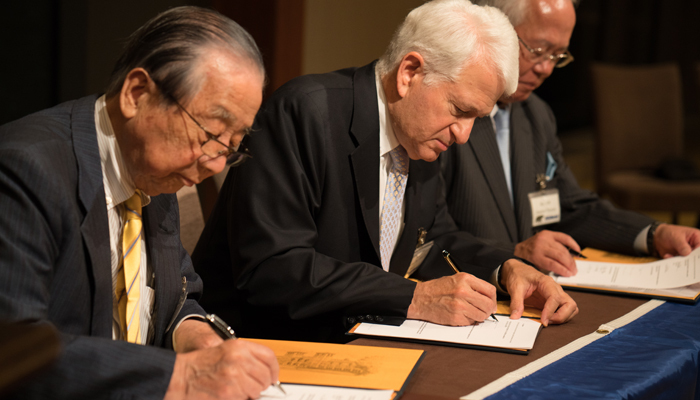 Signing the UCLA Japan Center MOU. From left: Masaru "Vic" Murai, UCLA Chancellor Gene Block and Japan Alumni Association President Tomohiro Tohyama. Signing MOA with the Commission on Higher Education (CHED) at the University of the Philippines. 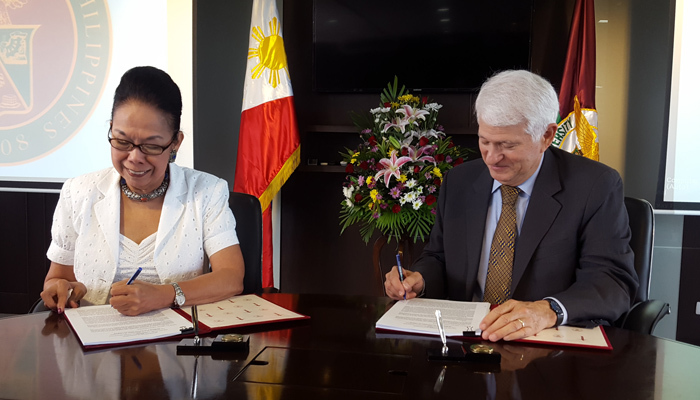 CHED Chairperson Patricia B. Licuanan (left) and UCLA Chancellor Gene Block. Speakers at the UCLA-USINDO Global Forum in Jakarta. 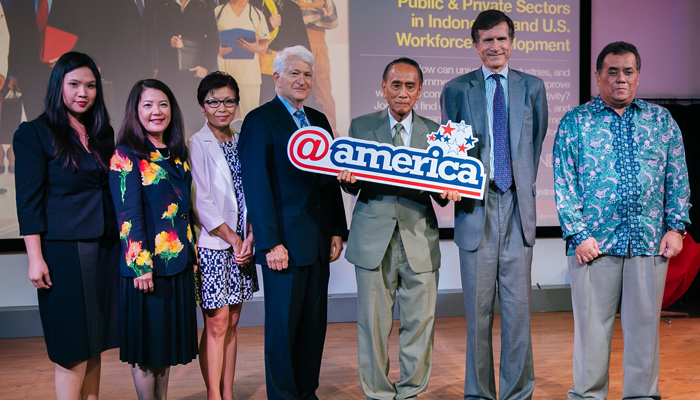 From left: USINDO Jakarta Country Representative Hazelia Margaretha, Retired East West Bank President and Chief Operating Officer Julia Gouw, UCLA Vice Provost Cindy Fan, UCLA Chancellor Gene Block, Former Indonesia Ambassador to the United States Arifin Mohamad Siregar, United States Ambassador to Indonesia Robert O. Blake and University of Indonesia Dean of Economics Ari Kuncoro. The UCLA delegation meets with members of the UCLA Asia Advisory Council and special guests in Hong Kong. Top row (left to right): Stephen Tan, Christine Loh, Craig Ehrlich, Leo Chien, LIU Chi, Mark Huang, Leland Sun, Arvind Singhal, Carol Lu, Nancy Tse, Frederic Demopoulos, Ken Wu, Joseph Lu, Derek Hu. Bottom row (left to right): Shirley Wang, Carol Block, Gene Block, Cindy Fan, Martin Matsui. Speakers at the UCLA Reception in Singapore. 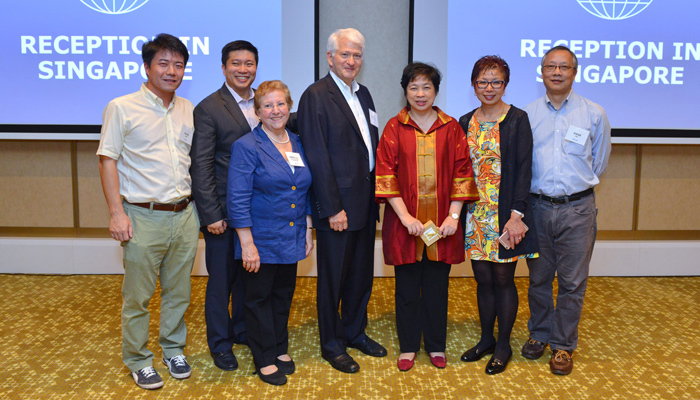 From left: Singapore Alumni Association President David Zhou, UCLA Director of Engagement for Asia Stephen Tan, Carol Block, UCLA Chancellor Gene Block, Hwee Hua Lim, UCLA Vice Provost for International Studies and Global Engagement Cindy Fan and Parent and Executive Committee Member of the UCLA Alumni Singapore Network Steve Chu. As part of UCLA's global engagement efforts, a UCLA delegation led by Chancellor Gene Block and Vice Provost for International Studies and Global Engagement Cindy Fan traveled to Asia in June 2016. As part of UCLA’s global engagement efforts, a UCLA delegation led by Chancellor Gene Block and Vice Provost for International Studies and Global Engagement Cindy Fan traveled to Asia in June 2016. While in Asia, the delegation visited Tokyo, Manila, Hong Kong, Jakarta, Singapore, Kuala Lumpur and Beijing, meeting with alumni and friends and exploring areas of potential partnership with government, education and business leaders. The visits to Manila and Jakarta were the first that Chancellor Block has made to the Philippines and Indonesia, respectively, in his role as chancellor. Stops in the two cities raised UCLA’s profile in Southeast Asia and established closer ties with local alumni and supporters. Alumni in Manila include a vice governor and a former member of the Philippines congress. While in Tokyo, the delegation celebrated the “soft” opening of the UCLA Japan Center with a signing ceremony and reception. The new center is the culmination of a grassroots effort by several leading UCLA alumni in Japan to create a dedicated space for UCLA alumni, students and faculty in the region to hold meetings and events. It is located in the Kashiwa-no-Ha Open Innovation Lab (KOIL) in Kashiwa-no-Ha City. In addition to the UCLA Japan Center event, several other gatherings were organized for UCLA alumni, students and friends during the Asia trip, including receptions in both Manila and Singapore, which were attended by 69 and 128 people, respectively; a reception in Jakarta (122 attendees) hosted by The Honorable Robert O. Blake, United States Ambassador to Indonesia; as well as UCLA Global Forums in Manila and Jakarta. The DNA that one gets at UCLA, through the UCLA experience, will better prepare us, graduates, for whatever we need to do after graduation… In my case, I gained substantially from the excellent program, of course, which continues to evolve and be relevant to changing conditions; the great faculty, which offered different and challenging ways of provoking thinking and innovation; and wonderful classmates from a diversity of backgrounds. . . I am happy to hear that the international component is increasing and, most of all, about the overall environment, which is so vibrant and very globally exposed and focused. At the Global Forum in Manila cohosted by UCLA and the Young Presidents’ Organization (YPO)/World Presidents’ Organization (WPO), Chancellor Block discussed UCLA as a leading educational institution in the United States, its strengths in the fields of medicine and entrepreneurship and its ties to the Philippines. In Jakarta, the UCLA-United States Indonesia Society (USINDO) Global Forum addressed “The Role that Universities and the Public & Private Sectors Can Play in Workforce Development.” Among the speakers were Ambassador Robert O. Blake; Chancellor Gene Block; Vice Provost Cindy Fan; Julia Gouw, retired president and chief operating officer at East West Bank; Ari Kuncoro, dean of economics at the University of Indonesia; A. Lin Neumann, managing director at AMCHAM Indonesia; Lutfi Rauf, assistant for foreign policy coordination at the Office of the Coordinating Political, Legal and Security Affairs Minister, and former ambassador of Indonesia to Thailand; and His Excellency Arifin Mohamad Siregar, co-chair of USINDO and former ambassador of Indonesia to the United States. While in Hong Kong, Chancellor Block gave a keynote at the Times Higher Education Summit in celebration of the 25th anniversary of the Hong Kong University of Science and Technology (HKUST). The president of HKUST, Tony Chan, is a former UCLA dean and faculty member. 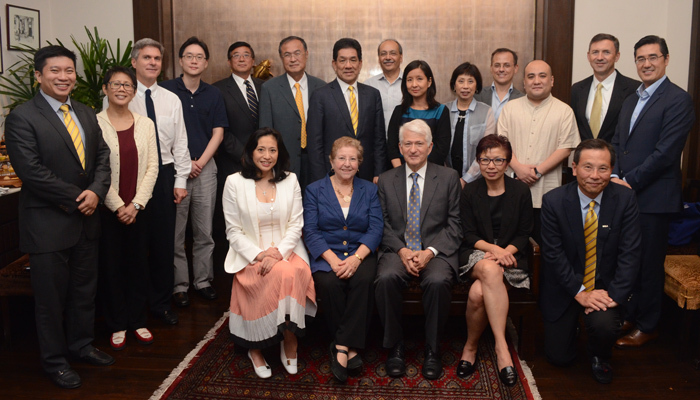 In addition, Chancellor Block hosted the inaugural meeting of the UCLA Asia Advisory Council in Hong Kong to discuss UCLA’s outreach in Asia with its council members. Members of the council hail from all over Asia, including China, Hong Kong, Taiwan, India, Japan and the Philippines. Both the European Campaign Committee and the Asia Advisory Council are member organizations of the UCLA Global Advisory Board, chaired by UCLA Foundation President Shirley Wang with alumnus and longtime supporter Craig Ehrlich as member. The trip also included a number of meetings with high-level local government, education and business leaders. Among the delegation’s accomplishments were the conclusion of a Memorandum of Agreement (MOA) with the Commission on Higher Education for the Philippines, a Memorandum of Understanding (MOU) with the Indonesia Endowment Fund for Education, Lembaga Pengelola Dana Pendidikan (LPDP), a meeting with Governor Basuki Tjahaja Purnama at the City Hall of Jakarta and meetings in China with the Ministry of Education and the Chinese Academy of Sciences.